Whether you’ve been doing personal visioning and planning work for a while, or are new to it, we can all benefit from doing a Mini SHIFT-IT Retreat every once in a while: checking in on how our life is going and what mid-course corrections we might want to make. Ideal times to conduct a mini retreat are late December / early January when a brand new year is upon you, when you have some vacation time to step out of your usual existence, or the anniversary date of a particular event or coaching alliance (for example, clients will often do a review session like this on the anniversary date of their initial SHIFT-IT retreat with me to freshen things up). These quick little retreats help you quickly appreciate what you have accomplished (what you’ve already manifested and attracted) – as well as identify what’s next brewing on your horizon — and the outer and inner shifts you will need to make to get there. They put your life into perspective. Giving you relief, satisfaction and an organized feeling –knowing you have taken a step to deliberately create what you want (not what you don’t want). Set aside about 90 minutes where you can be alone and relaxed. 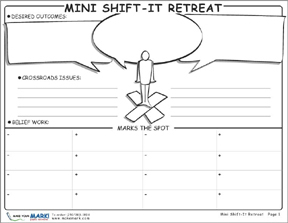 Have paper and pen handy (and print off my Mini SHIFT-IT Retreat Tools … link below). Relax. Put your feet up. Some good music on. Kick back. The key to receiving is ‘having’. Before you embark on new visioning work, think back on what you have already received. 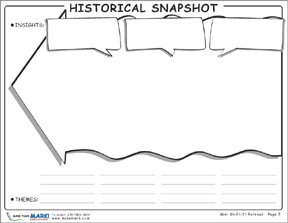 Look back on your previous year. What have you received? What has come your way? What did you get? What was once a dream or desire that has now materialized? We can SO quickly forget what we have received and just move onto what we next want. Instead, write down your answers. SEE what you have indeed received. Gratefully acknowledge that you do receive (and plenty!). When you do this you tap into the energy and vibration of ‘having’. That attitude of gratitude vibe goes out into the world and transmits a special kind of message. Attracts more ‘having’ back to you. A lot of people who do visioning work get themselves bent out of shape – I’ve been guilty of this many times myself. We get so focused on our desired future that our present circumstances frustrate us. The more we can accept and make peace with our present state the better. By accepting I don’t mean that you give up or stop desiring improvements. Just that you soften your energy around your now. Go into where you are. Accept it. Like it. Appreciate the role it is playing (as a necessary transitional bridge). Manifestation and change can take time, depending on what you are starting with and what you desire. Make the process easier by being ok with your present while you take steps to ensure a more satisfying future. List out where you are now. How do you feel about your now? What is most up or down for you? What crossroads are you standing on now? What issues are stirring you up the most? What areas of life are doing well? Not doing well? Our wants and desires are alive and fluid and always changing. Take a moment to reflect on what you now desire. Given what you have already accomplished and where you currently are, what do you want for yourself now? As my favorite Law of Attraction teachers Jerry and Esther Hicks say “What rockets of desire have now been launched?” What do you want the year ahead to hold for you? What do you want to manifest? What changes do you want to occur? Write out your answers. See what evolutionary nudges you are getting. List the whispers you are receiving about what is next for you. Get it down on paper! Even if it somewhat scares you because of its boldness or chutzpah! Don’t censor. Give it it’s first breathe of life by putting it in writing. Negative companions usually follow quickly on the heels of visionary thoughts —- as soon as our rockets of desire are launched, bazookas get pulled out to shoot them down. Write down your instantaneous reactions to your list of wants. Notice your instant positive reactions and welcome them. Then, notice what negative thoughts come up when you write out what you want? What contradictory thoughts do you hear – doubts, uncertainties and self sabotage? Capture in writing all of these negative reactions and then do the work of finding a better feeling thought to counter them – FLIP IT – FLIP IT GOOD!. Make the effort to change your internal programming – even just cleaning up one little degree of resistance can have a huge impact on your overall trajectory. When you get aligned with what you really, really want (your Personal Vision) certain things, people, places and steps will naturally start to emerge. Pay attention to the thoughts that swiftly follow FLIP IT work – the ideas, inklings and intuitions about what to do next. What ideas do you get about easy, natural next steps? Given where you are and where you want to go, what little things can you begin to do to close the gap? What will make movement towards your goals that you can begin today? 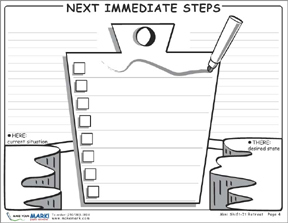 Write down your next steps and put accountability dates to them. Put them into your calendar and schedule. Find a support buddy, mastermind group or private coach to support and guide you. I’ve created several maps plus a detailed instruction booklet to guide you in doing the steps outlined above (I’m sharing them with you, my loyal SHIFT-IT e-Zine readers, as a holiday gift!). DOWNLOAD MAPS AND INSTRUCTION BOOKLET HERE Happy SHIFTing everyone and keep telling your new 2011 story until it becomes your norm and your new vibration!